Huawei P30 Pre-Order Starts on April 5! SRP Revealed! 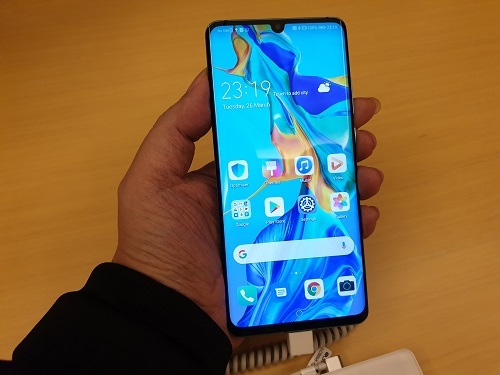 The Huawei P30 and P30 Pro were unveiled in Paris a few days ago and people have been asking on when will these shiny new phones arrive in our shores. Here’s the good news. We have received a message that the Huawei P30 Pre-Order will start in April! Yes folks, the Huawei P30 and P30 Pro Pre-Order will be on April 5-12, 2019. Every pre-order will also let you receive premium freebies to enhance your P30 experience. The Huawei P30 Lite is the most affordable model of the P series. This sleek phone comes with a screen display of 6.15″ with Full HD resolution. Huawei was generous enough to bump its storage and memory to 128GB and 6GB, giving users more reasons to store more apps and use them all at the same time without worries of crashing the phone. It also has a Triple Camera system composed of 24 Megapixels, 8 Megapixels and 2 Megapixels capable of taking those nice landscape and bokeh photos. It’s also good for gaming especially when GPU Turbo is enabled. 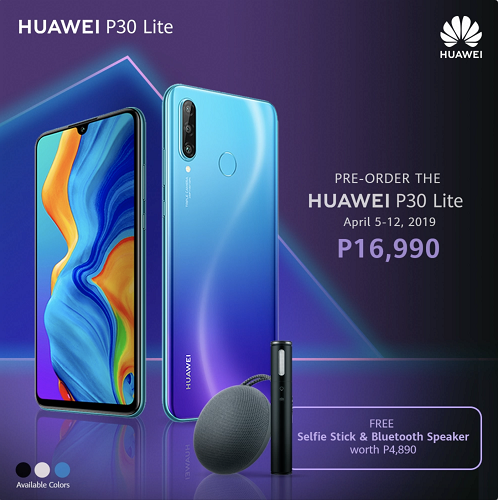 The Huawei P30 Lite can be yours for only P16,990! Every pre-order of the P30 Lite will also fetch you a Selfie Stick and Bluetooth Speaker worth P4,890. The Huawei P30 is the fourth version of the popular P series which started with the P9. It now has a Leica Triple Camera System capable of taking beautiful night photos and even in extreme darkness. Its processor is now upgrade to Kirin 980 (which is also found on the Huawei Mate 20 series) while its storage and memory was moved up to 128GB and 8GB respectively. 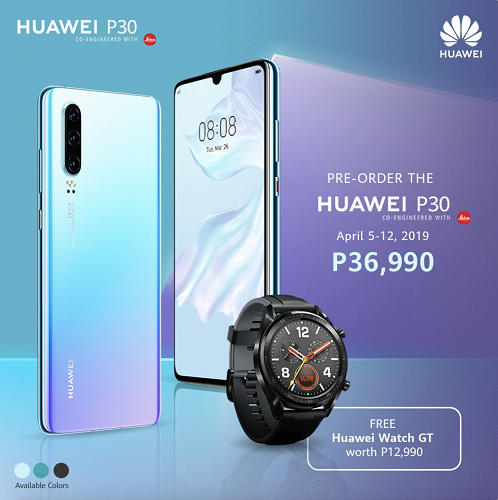 The Huawei P30 is worth P36,990 and when you pre-order this phone you can also get a FREE Huawei Watch GT worth P12,990! The Huawei P30 Pro is the crème de la crème not only in the P series, but possibly in all smartphones to date. 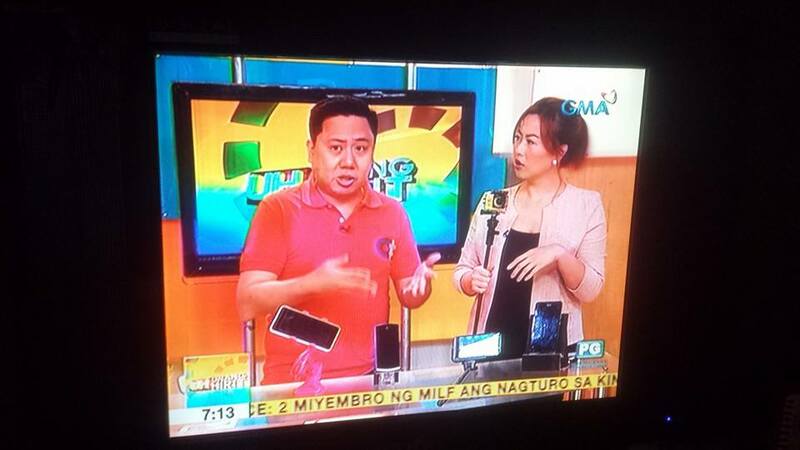 It’s their first phone to be equipped with a Leica Quad-Camera system that is composed of 40 Megapixels with f/1.6 wide angle lens, 20 Megapixels with ultra wide angle lens, a 8 Megapixel telephoto lens and a Time-of-Flight (TOF) camera which supports auto-focus and AI Image Stabilization. It is capable of taking spectacular night photos like fireworks and capture vivid details in extreme darkness. Thanks to its new periscope telephoto lens, it can zoom closer to far-away subjects with sharp results. The P30 Pro has a 6.5-inch OLED screen and is powered by the latest Kirin 980 processor. Storage is 256GB and Memory is 8GB. Battery capacity is 4,200 mAh and can now provide reverse wireless charging to other phones. 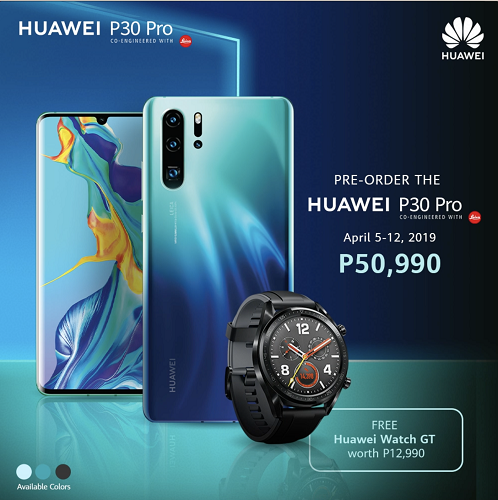 The Huawei P30 Pro is priced at P50,990 and if you pre-order, you will also get a Huawei Watch GT worth P12,990.